This award-winning word processor includes many of the innovative facilities found in classic text editors like Paperclip, TextPro, and The 1st XLent Word Processor, and version 3.21 sees the introduction of a spelling checker. More recently, the application has gained compatibility with VBXE’s hardware 80-column display. All versions of The Last Word since v.3.0 have been augmented by wonderful font collections designed by Paul Fisher (MrFish), who also authored the font catalogues and designed The Last Word’s loading screen. The Last Word won the “Application of the Year” award two years running (2009 and 2010, for versions 3.1 and 3.21 respectively), voted for by members of the ABBUC forum. 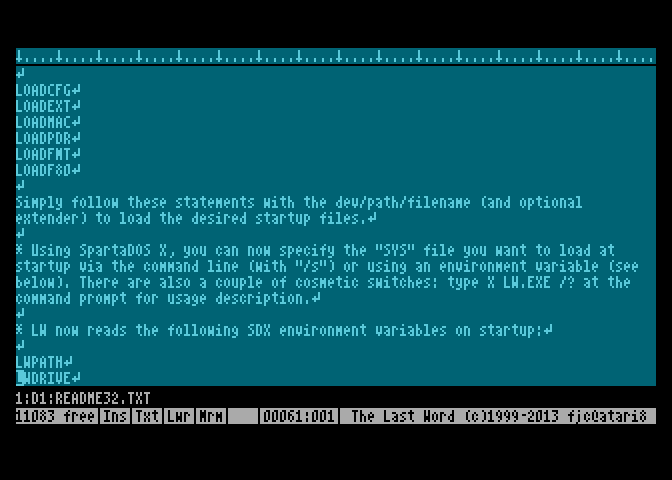 Version 3.3 of The Last Word includes VBXE hardware 80 column text support and numerous speed and performance improvements. This version has been at the release candidate stage for some considerable time now, and this has given me a chance to clean out a couple of bugs. Note that this release (hopefully the last version of the program in its current form) will be augmented by an updated manual and support files when time allows. Until then, extensions from previous versions should NOT be used with this release. Updated extensions will be provided when the final version of The Last Word is released. In addition, only the VBXE driver supplied here should be used with this version. The driver from the RC version will crash the program. Note: the previous version 3.3 offered for download turned out to have several nasty bugs, and is therefore superseded by the version below. Note: LW 3.21b is a minor revision of version 3.21, and fixes one serious bug in the file deletion verification routines, as well as a bug in the display routines of LW 3.21a. Version 3.21 and version 3.21a should be abandoned and 3.21b used instead. The new version is completely compatible with the support/configuration files of previous versions, and includes a couple of other improvements, such as the ability to manually specify RAM banking values.